Should you buy a Toshiba TV, and are they any good? | What Hi-Fi? Should you buy a Toshiba TV, and are they any good? Anyone in the market for new tech should be keeping an eye on Christmas and Boxing Day deals, and the January sales are of course just around the corner. TV deals are sure to feature prominently, with retailers looking to grab your attention with some headline-making discounts on 4K, HDR and OLED televisions. But which are the best TV deals? And the ones to avoid? The What Hi-Fi? TV reviews section increasingly focuses on a few key TV brands who between them dominate the market. LG, Samsung, Sony, Panasonic and Philips are the biggest players, and we'll be keeping our eyes peeled for TV deals on some of our favourite five-star sets from those brands. But if you're in the market for a real bargain TV, you might be looking elsewhere. Take a look at Amazon's best-selling TVs and you'll see some of the top spots are occupied by Toshiba. The Japanese giant has had a rocky time in recent years, having been a key player around the launch of HD TVs. But in the last few years, they have returned to the market. So are Toshiba TVs any good? And should you consider a deal if you see one? Should I buy a Toshiba TV? The good news? We reviewed the Toshiba 49U7763DB last year, a budget 4K TV, and were impressed with what we saw. It delivered a natural, detailed picture, an easy-to-use interface, and access to iPlayer, Netflix and YouTube. A solid four-star TV. There aren't many still knocking around the internet, but it sets a decent precedent nevertheless. Cheap, small Toshiba TVs proved less impressive. The Toshiba 32D3454DB was less of a hit, receiving a three-star verdict. The 32-inch TV comes with a built-in DVD player, access to iPlayer, Netflix, YouTube and more, two HDMI inputs, and all for £300. We were underwhelmed with the picture performance, however, it struggling to deliver good colours. The sound isn't great with busy action scenes, either, though you'll be OK for dialogue-driven TV shows. Amazon is now offering the Toshiba 32D3863DB for £299 as the closest replacement if you do want a cheap TV with DVD player. Should I buy a Toshiba OLED TV? It's not all cheap Toshiba TVs, however. The brand now offers 4K and even two flagship OLED TVs. Toshiba, in line with companies such as Philips, will use OLED panels from LG Display, the sister company of LG. There's no reason therefore that Toshiba OLED TVs can't deliver the deep blacks and bright colours we love so much about the best OLED TVs. The two Toshiba OLED TVs, the Toshiba 55X9863DB and the 65X9863DB, crucially support HDR video, Dolby Vision and HDMI 2.0. They have four HDMI inputs, plus three USB connections, work with Amazon Alexa, and offer Sound by Onkyo speakers. With many stockists already selling at below £1000, this could be a very tempting TV deal. Our verdict: We wouldn't be put off should an alluring Toshiba TV deal come along. Check for feature support, especially on cheaper models, as things such as HDR and 4K iPlayer aren't a given, but otherwise there's a fair chance they will offer decent value. 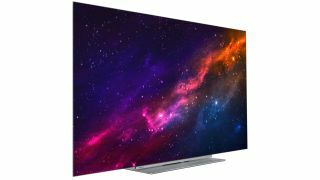 The Toshiba 4K OLEDs are well worth investigating if they are reduced, too, though we'd suggest for the ultimate performance, the very best LG OLED TVs may prove capable of better pictures. Samsung NU7020: Is this 4K TV deal any good? Hisense TVs: Are these budget 4K TVs any good?